The W50 supernova remnant, shown in radio (green) against the infrared background of stars and dust (red), is being nicknamed the Manatee Nebula. A watery-looking nebula in deep space is being renamed after the sea creature it strongly resembles: a manatee. The nebula is the leftovers from a star that died in a supernova explosion about 20,000 years ago. Before it died, the giant star puffed out its outer gaseous layers, which now swirl in green-and-blue clouds around the dead hulk of the star, which has collapsed into a black hole. 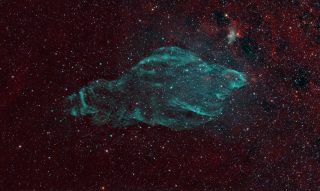 Known officially as W50, the celestial object is being dubbed the Manatee Nebula by the National Radio Astronomy Observatory (NRAO), during a ceremony today (Jan. 19) at the Florida Manatee Festival in Crystal River, Fla. The NRAO will also unveil a new photo of the nebula taken by the Very Large Array (VLA) radio telescope network in New Mexico. "When the VLA's giant W50 image reached the NRAO director's office, Heidi Winter, the director's executive assistant, saw the likeness to a manatee, the endangered marine mammals known as 'sea cows' that congregate in warm waters in the southeastern United States," NRAO officials wrote in a statement." A Florida Manatee rests underwater in Three Sisters Springs in Crystal River, Fla.
Manatees are huge mammals that average about 10 feet (3 meters) long and tend to weigh over 1,000 pounds (450 kilograms). These gentle giants propel themselves with flippers, and spend up to eight hours a day munching on sea plants. The new photo shows the manatee nebula seemingly mimicking a trademark pose of the animal, which is often seen floating on its back, with flippers crossed over belly. Manatees are endangered, in part because boat propellers often cut deep gashes into the herbivores' sides, injuring or killing many manatees every year. The nebula, too, bears streaky scars carved out by particles in the two protruding jets emitting from the black hole at its core. Crystal River Refuge, established in 1983 to protect the endangered West Indian manatee, is the home of the largest natural concentration of manatees in Florida. The Manatee Nebula, which lies 18,000 light-years away in the constellation of Aquila, isn't the only celestial object named after an Earthly creature: It is joined in the cosmos by the Crab Nebula, the Eagle Nebula, and the Pelican Nebula, among others.